I have had some readers asking about Ironstone China. Although I don't pretend to be an expert on Ironstone, I do love it. Especially White Ironstone. 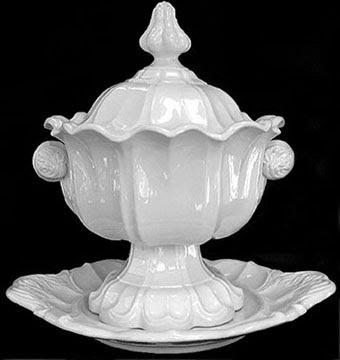 Last year, I found this lovely White Ironstone soup tureen at my town tag sale for a steal at only $5. But did you know that White Ironstone is only one type of Ironstone? Ironstone was first developed as a less expensive alternative to costly bone china and fine porcelain. The Ironstone that we are familiar with today was first patented by Charles James Mason in1813 in Staffordshire, England. Ironstone is made of white clay with pulverized flint or feldspar and slag left over from iron-smelting. These additives resulted in a strong and durable product that was difficult to chip. After 1827 when Mason's patent ended, many other potters began making Ironstone. 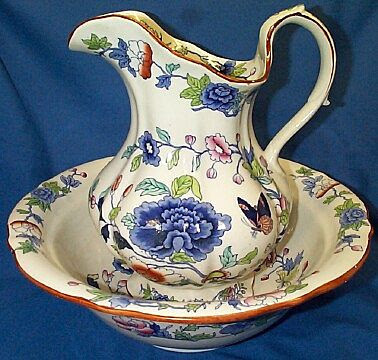 The Ironstone was decorating with transfer patterns (especially the popular blue willow) or painted designs. The plain white pieces that we love so much were not common in England, as they were mostly produced for export. 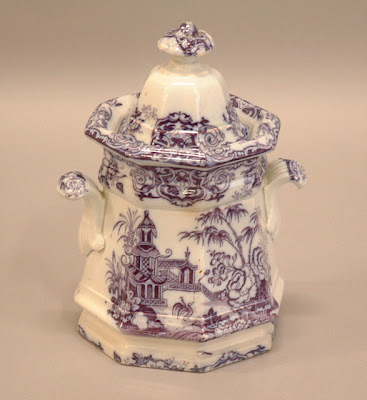 In the 1840's these plain pieces were exported to the US and Canada where they were valued for the fact that they were plain, unfussy, and durable. Backstamps can help to identify the age and manufacturer of a given piece of Ironstone, which in turn help to attach a value. Value is also based on rarity and condition of a particular piece. A quick search of the internet yields many sources for collectors to help them identify the approximate age, manufacturers and value of various pieces. Interesting - I thought ironstone was always white. I have a small collection of white ironstone - great to mix & match with other patterns. Love your tureen - what a find! Thanks for the helpful information. I love ironstone, and I've had a piece or two that was very difficult to identify....these websites may be very helpful in the future! and i do love ironstone....the older and chippier the better. Thanks sooo much for sharing this info...love Ironstone...it's soooo pretty!!! Hello~ I love ironstone and have been on the look out for more. What a great find for $5. You are lucky! Thanks for all the helpful info. Loved learning about it. great find in your soup tureen!